Introducing Acoustic Element, the violin and guitar duo that has quickly become one of Cape Town’s most favourite contemporary acts! When cousins Callen Petersen and Jody Abel combined their musical talents, an extraordinary combination was born. Callen on the violin and Jody on the guitar make up the musical duo. 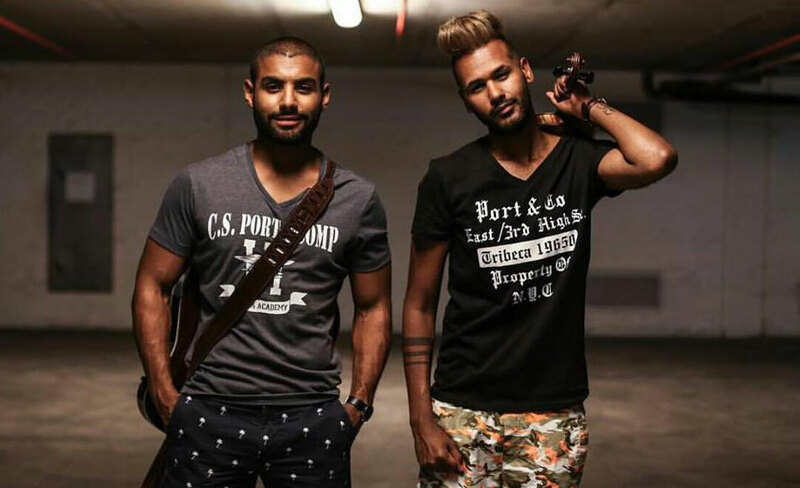 Since their arrival on the Cape Town entertainment scene, Acoustic Element has performed alongside some of the country’s hottest performers, including Jimmy Nevis, Chad Saaiman, Bianca Le Grange and Auriol Hays. The duo have a diverse repertoire and are able to adapt their genre to suit any desired style and taste. From pop and rock, to jazz standards and smooth ballads, AE are able to cater for any function. They play both acoustically for a background feel, and also with pre mixed backing tracks and a DJ for a more party and festival event. The Grand White Dinner 2014 and 2015 – a nationwide tour which takes place in Cape Town, Joburg, Pretoria and Durban each year. 2015 saw an approximate of 15,000 people attend the event. 2014 Divo’s concert at the Grand West Arena. Grand opening of the Park Inn by Raddisson Newlands Hotel alongside Jimmy Nevis. Having performed for a wide range of events all around the country – from weddings and markets, corporate events, concerts, parties and clubs, AE know how to ensure that your guests enjoy the entertainment they provide. Notable clients which they have worked with include Investec, Old Mutual, Sanlam, Grandwest, Amdec, Prime Media, Grand White Dinner and SAICA. They have also performed at Cape Town clubs such as St Yves, The Living Room and Plan B. With the unique charisma and flair, Acoustic Element is sure to give any event that “something extra” to make it an unforgettable experience!.